What, exactly, does this holiday mean? Is it “sacred,” as so many patriots claim? Is it even possible, or proper, for a secular celebration of a long-ago separatist war to be called “sacred”? Certainly, the Fourth of July is understood worldwide to be at the heart of Americanism. It is understood to be a deeply held and fiercely celebrated day of patriotism. The almost unshakable habit of American exceptionalism, whereby with a wink and a patronizing nudge we tell the rest of the world, “we’re better than you” — this, I think, is one of the things that even our closest allies find most irritating about our country and countrymen. Because there is something here to celebrate, regardless of whether you’re an American. 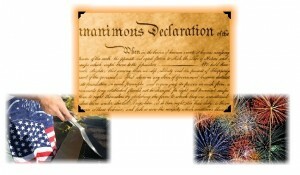 What happened on July 4th, 1776 was, lest we forget, a metamorphosis for the human condition. Recent events like the Arab Spring seem to suggest that the struggle for self-determination is a natural, unstoppable progression. But it’s not. The action taken in Philadelphia on that day was a radical, dangerous departure. With the benefit of hindsight we know that the signers of the Declaration were on the right side of history. But from their perspective the most likely outcome must have seemed to have been: the gallows for them, shame and poverty for their families, and a swift crib-death for the idea of liberty. So here we are. Thanks to the intelligence and bravery of those patriots, and to the skill, luck and pluck of the Continental soldiers who fought to enforce their Declaration, and to the intrepidness of all the warriors, statesmen and citizens to follow…we find ourselves in a position to celebrate our Fourth. Are we celebrating it correctly? Are we doing it justice? Those questions go to the heart of this deconstruction. Some part of me — the part conditioned by seeing Labor Day and Veterans Day and Memorial Day celebrated with prices-slashed-beyond-belief mattress sales — wants to say no. I want to say that our cookouts and fireworks aren’t doing justice to the memory of a Declaration created in fire and blood. But I’m rethinking that knee-jerk naysaying. I’m deconstructing it, if you will. Maybe only because I’m planning on a bit of that stereotypical bbq-ing and beer-drinking myself. Maybe I’m just excusing my own shallow behavior. I don’t think so, though. Because it doesn’t feel shallow. It feels right and proper. It feels liberating. And liberation happily springs forth (Fourth?) from its root word, liberty. This nation was forged and fought for, for nothing less than the liberty of its people. Its people should feel free to indulge that liberty, on this day if none other, with a sense of celebration. Its founders, I think, would smile upon that. So enjoy your Fourth, your cookouts, your fireworks. See you on the fifth. This entry was posted in New Post and tagged deconstruction, Fourth of July. Bookmark the permalink.